The rupee has crashed, growth is down and there is panic that the India story may be over or, at least, seriously dented. For most commentators, the underlying reason for the decline is green regulations. They think environmentalists are squarely to blame. This argument is only partially true. It misunderstands what many environmentalists have been asking for and it presupposes that green regulations actually work. It also downplays the mismanagement of resources and the complete breakdown of the regulatory system that has led to the present crisis. Take the example of mining. It is said that India’s iron and steel industry is bleeding because of bans, first in Karnataka and now in Goa. It is also said that coal is being imported because we cannot get permissions to mine in the forests of central India. And of course, it is said that huge investments made in bauxite refinery of Vedanta will now go waste because of 12 illiterate villages. In short, it is the environment that has brought India down. The fact is that India does need to mine minerals, even though they are found underneath its most precious forests and the homes of its poorest people. The question is: how will it regulate the mines to ensure that damage is mitigated; that mining does not destroy ecologically sensitive areas and watersheds; and that it has the consent of the people? In 2008 my colleagues had raised these concerns. The impact of mining on the environment was huge. Our research showed that the key issue was the utter lack of capacity of mining regulators to oversee the industry and to push towards resolution of the problems. It was not mining but the oversight of regulated mining and rules for inclusive growth that were at the root of the problem. Based on this research we made presentations before different government committees. We argued that this sector was out of control and rapacious. It needed to be reformed so that the country could mine sustainably. But the government and the industry paid little heed to our argument. Everyone wanted to mine as if there was no tomorrow. And they did. In Bellary and Goa, large tracts of land were brought under mining. We reported on the illegality of mines, the absence of roads for transportation and how companies did not pay royalty to governments. It was loot. When it went too far and became too obvious, something had to be done. The courts stepped in. First in Bellary, where till then the all-powerful Reddy brothers ruled the roost, terrorising anyone who dared come in the way. The action was a reaction: close down all mines. A few years later this happened in Goa as well, where competitive populism ruled. The present chief minister was in the opposition then. Illegal mining was his election plank. The report of the Shah Committee, set up by the Union government, came at an opportune time. Then the court ordered closure of all mines. But this is not to say that the closure is permanent or that these steps end up fixing things for the better. In Bellary, all mines have either been reopened or are in the process of reopening. The Central Empowered Committee of the Supreme Court was asked to examine the cases and advise the court. It classified mines in three categories—no major encroachment of forestland; some encroachment (up to 10-15 per cent of the mine lease area) and encroachment on more than 10-15 per cent of the mine lease area. It asked for mining plans from the first category and allowed it to function; the next was told to pay a penalty, prepare a plan and then opened, and only the third category mines have yet to open and there are proposals to cancel lease. By April 2013, of the 166 mines closed down 108 had started operations again. All this would have made sense had the institutions now responsible for managing and regulating operations been made stronger and more accountable. But that is not the case. So, there is no reason to believe that the mine reclamation and rehabilitation plan will be put to use this time. There is no reason to believe that mining will not once again become as destructive and as rapacious as before. In Goa, the story is set to repeat. There are three central players—the state government, the Union Ministry of Environment and Forests and the Supreme Court’s committee— who are vying for kudos for closing and opening the mines. In all this, there is no understanding of how to demarcate the boundary of a national park or protected area so as to ensure that mining is kept out of these high biodiversity zones. It’s getting messy. Tempers are rising. In all this, Goan iron ore mines will be reopened. One cannot have a blanket ban on mining. Nor can one argue that there should be no mining in Goa because “it is in my backyard” but it should be allowed in Chhattisgarh where the poor and the powerless live. But will the reopening of mines take into account environmental safeguards and bring local benefits? Let’s discuss this next fortnight. Excellent Editorial. Rupee decline is mainly due to mismanaged economy. Instead of reducing corruption and increasing productivity in vital sectors why blame Green Regulations? As I said in my comments on previous article - the solution lies in capacity building within the State Geology & Mining Departments that grant leases and monitor; the DGMs are defunct at present. Closing mines/stopping is no solutions. If DGMs have failed to discharge their duties in past, the reasons need to be analyzed. State DGMs need to be empowered and strengthened and be governed by a Board of Management under Ministry of Mines and also headed by qualified & trained Geologist. (1) Single window system at State Govt. Geology/Mining Department for grant of lease for assessment/prospecting and mining/quarrying. (2) Preparation of a check list to be followed for grant of lease for assessment/prospecting and mining/quarrying. (3) Strengthening/up gradation of State Govt. Geology/Mining Department in terms of manpower, equipments and infrastructure and should be seen as a major revenue earning organisation. (4) A Board of Management be constituted at the Centre preferably in the Department of Mines, Govt. of India to supervise/monitoring of working of State Govt. Geology/Mining Department throughout the country. (5) All minerals inclusive of minor minerals, atomic minerals, hydrocarbons, fossil fuels be declared as National Asset, necessary amendments need to be made in MMRD Act for it without altering the existing provisions related to rights of State Govt. on minerals and grant of lease etc. provisions. (6) All mining/quarrying activities irrespective of size of area and quantity need to be granted by State Govt. Geology/Mining Department within a stipulated time frame. Failure to grant permission/approval/ clearances within the time frame be deemed as grant of permission/clearance and all consequential liabilities in such cases would rest on State Govt. Geology/Mining Department. (7) All mining/quarrying activities irrespective of size of area and quantity need to be covered under the provisions of MoEF for necessary clearances within a stipulated time frame. Failure to grant permission/approval/ clearances within the time frame be deemed as grant of permission/clearance and all consequential liabilities in such cases would rest on MoEF. In this article Ms.Sunita Narain has provided an excellent update and analysis of the situation by highlighting that the it was not mining but the oversight of regulated mining and rules for inclusive growth that were at the root of the problem. A recent World Bank (July 2013) report for India states that, the cost of environmental damage is estimated to 5.7% of IndiaÃ”Ã‡Ã–s Gross Domestic Product (GDP). Latest GDP growth rate figures touching 4.5 percent means that it is not even zero sum game but a negative growth. If the above World Bank findings are to be believed, it is high time that the policy makers and the think tanks waste no further time and consider reducing the growth targets which are putting tremendous pressure on IndiaÃ”Ã‡Ã–s biological capacity and carbon foot print. It is a pity and shame that in a mineral and coal abundance country, coal has to be imported because of closure coal mines by the enforcement and legal agencies. Over 60 percent of IndiaÃ”Ã‡Ã–s electricity is thermal power which is coal fed. It is high time that the regulatory authorities under the oversight of legal entities burn mid night oil to find amicable solutions for controlled mining. Over the past few weeks, I have been reading with great interest various stories in the news media on illegal "Sand Mafia" operating in various parts of India including suspension of an IAS officer in Greater Noida who dared to challenge this mafia. The entire construction industry in India is suffering from huge shortage of sand and crushed stones. It would be prudent to have an overview of challenges in the construction sector while formulating strategies to meet even bigger challenges during the 12th Plan period where the investment level will be over twice the 11th Plan. The infrastructure growth targets are very ambitious in the 12th Five Year Plan (2012-17) where in Rs. 50-60 lakh crore is envisaged for infrastructure sector. As a Ã”Ã‡Â£Thumb RuleÃ”Ã‡Ã˜ almost half of these investments are going to be directed to the Construction Sector. In pursuance to Supreme Court Orders closure of Stone Quarries in most states has encouraged huge spurt in illegal mining activities and has led to acute shortage of stone aggregates and prices have tripled or quadrupled. This situation has led to utter chaos in the construction industry and has promoted illegal mining, corruption amongst enforcement agencies and substantial delays and increase in cost of various infrastructure / housing projects ultimately payable by public and the tax money. Sand and Stone Crushing Industry is an important industrial sector in the country engaged in producing crushed stone of various sizes depending upon the requirement which acts as raw material for various construction activities such as construction of roads, bridges, buildings, irrigation works etc. It is estimated that there are over 12,000 stone crusher units in India. The number is expected to grow further keeping in view the future plans. For example, the estimated consumption of stone aggregates for the roads sector alone in 2010 was 160 million cubic meter. With an annual increase of 5 percent, this will grow to 450 million cubic meter in the year 2030. These are huge quantities and should raise concern about the availability of stone resources and exploitation of natural resources, health and environmental issues. 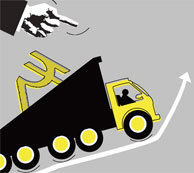 Ms.Sunita Narain rightly suggests that Ã”Ã‡Â£one cannot have a blanket ban on miningÃ”Ã‡Ã˜. Now, India being dragged into the economic crisis, it makes all the sense that the institutions responsible for managing and regulating operations are empowered, made stronger and more accountable. The article really makes a very weak, if not futile, attempt to defend the inevitability of continuing mining. In the past, when we were opposing large dams particularly in ecologically sensitive areas that too submerging and dislocating thousands of tribal habitats and poor people, we were faced with questions such as what is the level of compromise (sacrifice if you may)one needs to make to satisfy both the requirements of 'development' and environment protection/social justice? Can we (or do we dare to) place the development requirement such as mining, dams, roads, industries etc. in an order of priority (ranging from inevitable to unnecessary)so that one can take up developmental activities without disturbing one's conscience? Mr Agarwal and your editorial seem to overlook a very pertinent fact that was brought out in the Greenpeace report that the Ministry of Environment & Forests has already granted clearances far in excess of official targets for the 12th Five year Plan (2012-2017). Coal India Limited already has access to over 200,000 ha. of coal bearing areas, including 55,000 ha. of forest land. Given that clearances have already been granted for quantities of coal extraction that exceed plan targets, why are the Coal Ministry, Coal India Limited and other branches of government continuing to clamour for faster clearances for additional coal mines and power projects? and blaming lack of clearances for our economic woes. It is also a question of prioritising - certain areas, such as those deemed important enough to be in our PA network, should be no-go for mining. And why do we still put such dependence on coal... It is time to give higher priority to more sustainable forms of energy. Preferably before all our forests and biodiversity is destroyed for this limited resource. It would be interesting to know how much time MoEF takes in granting the clearances since filing the applications. if MoEF is not responsible for non-start of mining/quarrying of coal, somebody must be responsible for the non-performance. The matter does not seem to be this simple Ã”Ã‡Ã´ MoEF clearance exists but mining does not commence?